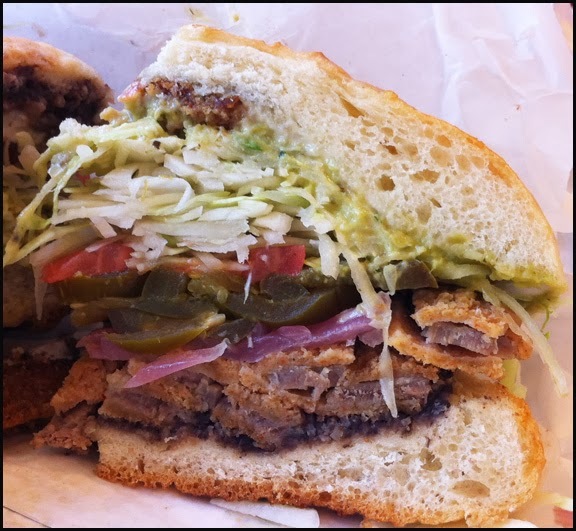 Food Rumble: TORTAS! TORTAS! TORTAS! I really like Mexican sandwiches, known as tortas. Made with meats like grilled beef, roast chicken or al pastor and usually topped with cheese, lettuce, tomatoes, onions, avocado, refried beans and mayo, these subs are straight forward, hearty and delicious. Personally I feel the layer of refried beans is what makes the torta special. On its own, the beans add its unique flavour but more importantly helps enhance the savouriness of the ensemble. I’m not sure why but whenever beans & meat are combined, you get a deliciously savoury dish. Off the top of my head I can think of chili con carne and cassolet as examples. The torta would not taste the same without the beans. For this rumble I was concerned that it wasn’t going to be a fair fight. I was pitting a specialist, Los Tortas, against a generalist, Salsa & Agave. Typically if you want the top version of something, you usually seek out the specialist. Before sampling the sandwiches at each location I thought Los Tortas would runaway with this contest. 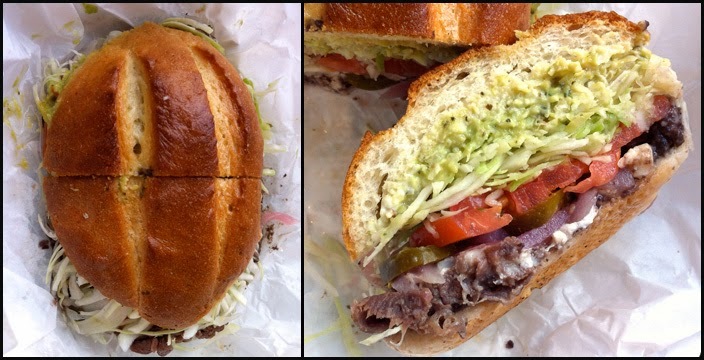 For this rumble I chose to compare an Asada (Grilled Beef) Torta and a Milanese (Breaded Beef) Torta at both eateries. So with out further delay, let’s gets this rumble started. Salsa & Agave is a Mexican focused restaurant in Yaletown that serves various dishes without a specialty. In addition to tortas, they offer a wide range of Mexican dishes like tacos, burritos, tostadas and sopes. The Asada Torta at Salsa & Agave is $6.50 (without tax) and cheese is a dollar extra, which I added. The torpedo shaped bun was toasted on the outside, sturdy enough to contain all the ingredient but each bite was soft. In addition to the asada and cheese, the filling consisted of avocado, beans, tomatoes, lettuce, onions, pickled jalapeño peppers, and mayo. I thought this sandwich was well balance, with each of the ingredients adding flavour and/or texture to each bite. Although I didn’t feel the beef tasted grilled, it and the beans added the savoury element to the meal. The cheese and avocado were creamy. The onions and jalapeno added pops of spiciness. I liked the sandwich. The Milanese is more expensive ($7 or $7.5 not including tax – I can’t recall which and I can’t find the receipt) with the same cheese option for another $1, which I declined. 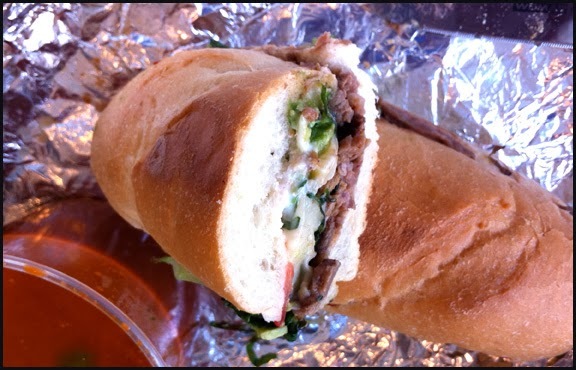 All the other vegetable toppings & condiments of the Asada sandwich can be found in the Milanese. I can say that the extra cost of the Milanese was not worth it. I watched a few Youtube videos of Mexican ladies preparing the bread beef and what I got at Salsa and Agave was not close. The Milanese should be a thin beef steak that’s seasoned, breaded and then fried. You can think of it as a thin beef schnitzel, which is served as a whole cutlet or cut into large strips so it can be placed in the sandwich. However, the Milanese I got contained small slices of beef and clumps of breading. The cook did a poor job of preparing the beef cutlet as I don’t think the breading should be separated from the beef. This was not a good Milanese torta. Las Tortas has a small menu offering tacos and burritos but their main focus is torta. They offer 14 gourmet options for their customers to choose from, making them a torta specialist. The Asada Torta comes with cheese for $11 (tax included). Accompanying the grilled beef was finely shredded cabbage, sliced tomatoes, refried black beans, guacamole, butter, mayo and pickled red onions and jalapenos peppers. The bread was a bit chewy and overall the sandwich soggy. The beef was well seasoned but like Salsa & Agave’s preparation, I could not tell if it was grilled or not. I actually didn’t really taste the cheese is the sandwich except in a few bite. In fact, I found the beans and guacamole were missing in action as well. The source of the sogginess might have been the voluminous amount of cabbage and the pickled ingredients. The onions were not actually sour and didn’t have a lot of flavour. I felt the ingredients in the sandwich were not in the right proportion as I found the large volume of cabbage was too overwhelming. I didn’t like the Las Tortas Asada sandwich. The Milanese at Las Tortas cost $10 (taxes included) and the breaded beef cutlet was prepared properly just like in all the Youtube videos I watched. The breading stayed on the meat. However it wasn’t crispy as other ingredients (same as the Asada minus the cheese) made the cutlet soggy. The flavour of the beef and the fried breadcrumb coating provided more flavour to the torta than the asada filling. The crunchy cabbage worked better with Milanese filling. I did like the Milanese from Las Tortas. Based on the sandwiches, it was a tie, with Salsa and Agave’s Asada torta being better and Las Tortas’ Milanese offering being the superior of the two. However, I found the proportion of the ingredients in Las Tortas’ sandwiches out of sort. There was too much cabbage. The refried beans and guacamole were spread very thinly, which made them hard to detect. The large amount of bland pickled onions, along with the peppers, probably caused the sandwiches to be soggy. In contrast, I found Salsa & Agave’s ingredients were present and accounted for in terms of taste. The cook put enough of each ingredient so that they added to the overall flavour of the sandwich. The chunks of avocado, the layer beans and generous amount of melted cheese made the Asada torta delicious. Another issue I had was the value at Las Tortas. Both eateries are in high-end neighbourhoods, which usually means sky-high rents. So to see a sandwiches go for 8, 9, 10 dollars is not unusual, especially in Yaletown. However, in exchange you usually get premium ingredients and lots of meat. For example, think about the Porchetta at Meat and Bread, the crab salad sandwich at the Dirty Apron Deli and the cold cuts banh mi at DD Mau – the protein is ample and the star of the show. However at Las Tortas you get a lot of cabbage and other vegetables. I don’t think of cabbage, tomatoes, pickled onions and peppers as premium or gourmet ingredients worth the extra $2 – $3 Las Tortas charges in comparison to Salsa & Agave. For the $10 – $11 price tag, I expect to see more protein. In fact, if Salsa & Agave hadn’t botched the beef cutlet in their Milanese, they would have won this rumble in a landslide. Not bad for a generalist.